Between the US presidential election; European Union’s hand-wring over Greece, Spain and Italy; Middle East unrest in Egypt, Syria and beyond; a Chinese economic slowdown and an impending global food shortage, it is easy to understand why economics is called the “dismal science.” The latest economic tea leaf reading is skewing negative with increased predictions of a 2013 (or sooner) US recession and few glimmers of hope. With such a great deal of uncertainty in the world, it makes workforce preparation difficult but not impossible. Navigating uncertainty might be the softest of the soft skills. It is not a skill set management has traditionally recognized let alone embraced because by definition, it is the antithesis of “management by fact.” Why? Because navigating uncertainty is managing without specific information. A couple of my clients have looked at me like a heretic for suggesting the HR function’s success will be dependent on our leaders’ mastery of these soft skills – others have looked relieved to have confirmed that those soft tools in their toolbox are still useful even as they undertake an analytics journey. I believe the successful organization of the future and the HR functions that enable the success will be those who know when to lead with the “left side” of the brain, when to lead with the “right” and most important how to easily and effectively transition between the two. I do not know my left from my right. I could blame it on dyslexia, which may be a contributory factor, but I imagine I was born without that instinct. When I verbalize “left” versus “right” when giving driving directions or facilitating a workshop, my chances of being correct are about the same as guessing “red” v. “black” on the roulette wheel – fortunately I am pretty lucky. 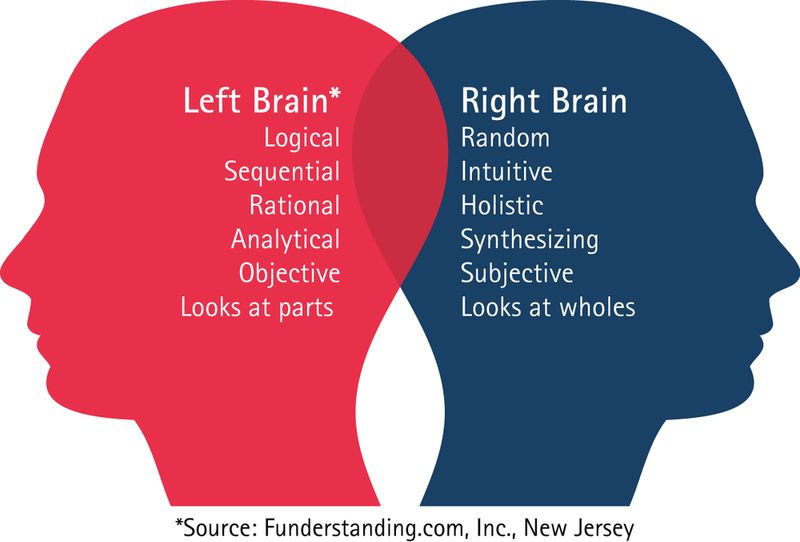 The whole “left brain/right brain” concept is a scientific misnomer and some even call it “junk science,” but it is a very useful metaphor for the rest of us to use to categorize different mental capacity, skills and preferences. Ignoring the accuracy of the classification when I use the label “left brain,” I mean the logical, analytical and linear thinking skills. The label “right brain” refers to the intuitive, reflective and holistic thinking skills. If you are a fan of the Myers-Briggs Personality Inventory, the ultimate left-brainer is an “ISTJ,” or Introvert, Sensing, Thinking, Judging, personality type and the ultimate right-brainer is an “ENFP,” or Extrovert, Intuition, Feeling, Perceiving personality type. Traditionally, left-brain skills have dominated the business world through the industrial revolution and the information age. As Daniel Pink describes in the first pages of A Whole New Mind, the left brainers who have reaped society’s financial rewards are the computer programmers building code, the lawyers drafting contracts and the MBAs crunching numbers on Wall Street. Pink argues in his 2006 book that the world is shifting from an Information Age to a “Conceptual” Age. Rather than economies and wealth creation driven through the mastery of data (a left-brain specialty) the next period of economic growth will be driven by satisfying artistic and empathic needs (the right-brain specialty). I must confess, I am a huge Daniel Pink fan, but I recognize he has his critics, especially in the academic world who describe his work as “pop psych” with the same disdain they may depict for the rumored fourth installment of the Johnny Knoxville franchise Jackass. I appreciate the way Pink pulls on multiple academic, social and business sources and trends to create a framework we can use to think about the world. With that caveat, I would argue the left versus right is the wrong paradigm; rather, I believe the status of right-brain thinkers will be elevated in the next era but does not supplant the left-brain “masters of the universe.” The trick will be to manage the two sometimes competing styles to create something greater than the whole either could create on their own. This is the role of the HR function of the future. The reason analytics is so important to HR’s long-term success is it historically has not been our strength. We must up-skill on the left-brain skills and, at the same time, help our business leaders increase their right-brain capacity. It is not one-or-the-other; it is both. Will it be a formidable task? “Yes.” But in a highly competitive world, it is a necessity. “The future organization is a web that will weave itself. Multiple networks of individuals and organizations constantly being woven will morph their relationships to respond to the constant flow of both opportunities and threats,” Mary O’Hara-Devereaux wrote in her book Navigating the Badlands:Thriving in the Decade of Radical Transformation. The problem our leaders have today is this future organization does not exist yet – it is an “end state.” “Yes,” there are pockets and examples of organizations starting to build alliances with suppliers, customers and (gasp) competitors but these organizations are looked upon like science experiments. We are interested in their results but not sure if they have any practical applications to the real (read “our”) world and most of our leaders, especially those in publicly traded companies, are not willing to buck conventional wisdom and experiment with shareholder dollars. Today (2012–2013), we are not only facing the political and economic malaise I cited at the beginning of this article, which would make business planning difficult in the most boom times. “No,” this political and economic malaise is a symptom of a bigger shift in human evolution. While the media often overstates that every event we experience is unprecedented and delights in the use of superlatives, we truly are in the middle of either a new age or revolution. Imagine talking to a farmer in Ohio in the 1820s on the cusp of the industrial revolution. The value of his crops has been reduced because the overall supply has increased as wealthier farmers use new machinery – machinery he cannot afford – to increase their yield. Not able to support his family, some of his children are sent to the cities to live in the slums and work in the new factories. The remaining children now must work even harder as there are fewer hands in the field and a need to increase production to make up for the lower crop prices. Do you think he would believe the US is on the verge of prosperity like the world has never seen? Could we be living in a similar transition state? Leaders have a dual challenge, to manage both the short-term ambiguity but also the long-term shift. This is the fundamental reason new skills conventionally regarded as “right-brain” are so important to successfully manage the transition. The good news (and there is good news) is that historically these transitions occur more quickly over time – to say another way – we will not have to suffer through generations of insecurity like the 1820s farmer. "Growing up we were led to believe that the future was predictable enough, and if we studied hard we could obtain the work we wanted in an environment we understood, and we would live happy and successful lives…The way we were taught to think and act works well in a predictable future, but not so much in the world as it is now. You (or your parents, teachers, or bosses) forecast how the future will be. You construct a number of plans for achieving that future, picking the optimal one. You amass all the necessary resources (education, money, etc.) necessary to achieve your plan. And then you go out and make that plan a reality. We have become so indoctrinated with this way of thinking by our education and our organizations that it is more or less the only way we approach anything." A very “left-brained” approach to the world. The authors studied successful serial entrepreneurs, individuals who have started at least two successful enterprises. If you only look at behavior, at first blush each entrepreneur appears totally unique and there are no uniting principles or key learnings to be found. But drawing on the research of Saras D. Sarasvath, a professor at the University of Virginia, the authors derived a formula for the entrepreneurial approach to problem solving. 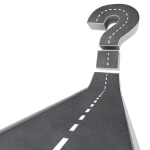 Why study entrepreneurs to learn about navigating uncertainty? The authors believe these are folks who deal with uncertainty daily and serial entrepreneurs have mastered this set of circumstances. Their formula is based on three simple practices: Act, Learn, Build (repeat). The authors assert the entrepreneurial approach is, rather than analyze a situation, create a plan and then doggedly execute despite roadblocks and circumstances, to identify a desired result, swiftly take a small action in pursuit of a goal, assess and learn from success/failure of the action and build your next action step. How is this approach more right-brained than left? The authors of Just Start never explicitly use the term. They speak from the “predictive” mindset to a term they coined the “creaction” mindset, which is a combination of the words “create” and “action.” Foundational in their entrepreneurial methodogy is creativity, creativity in how goals are expressed, how risk is assigned, and how success and failures are evaluated. But subtle right-brain skills are underneath the authors’ recommendations and illustrated in the examples provided. “Regulate emotions,” which is about both self-awareness and stress reduction. As the authors of Just Start point out, if you are to upset by failure and disappointment you will be unable to see opportunity and capitalize on your learning. There is one additional ingredient to navigating uncertainty I have discovered through working with a client, an optimistic mindset. When organizations have a “can do” culture and leaders explore possibilities rather than obsess on “not losing,” a world of possibilities opens up. Dawna Jones highlights this phenomenon in her podcast recalling speaking with two executives/surfers. The first executive explained to Jones that “out on the water we are one team, if someone is in trouble we all jump in to help” while the second executive told Jones “out on the water it is ‘dog eat dog’.” Jones mused about which leader you would want to follow. A corollary is true for organization. Which organization is going to get their employees’ discretionary effort? Which leader is going to attract the highly talented and motivated employees? And which organization will build customer loyalty? As your organization plans for 2013 and beyond, first and foremost understand the market conditions driving the market outlook and the strategy to compete with competitors. These are the most useful tools to build the HR functional strategy. Without this business acumen, HR is doomed to remain a mere cost center and not a source of competitive advantage. Second, advocate building right-brain capability in your organization through leadership assessment, training, selection and performance management. Finally, assess your culture. If your culture has an optimistic mindset and values both left- and right-brain thinking, protect it! Ensure you have policies and leaders that continue to cultivate a culture of confidence and success. If your organization culture is negative and stuck in survival mode, identify what is creating and reinforcing this self-defeating mindset. It may have helped your organization endure the economic crash, but in a period of transition it is not the culture of achievement and long-term survival.